A perfect replacement strap for my worn out range bag. Perfekte schnelle Abwicklung von DAA. Ich hatte kaum gehofft, den Schultertragegurt als Ersatzteil zu bekommen. Eine ANfrage beim Ausstellungsstand von DAA bei Infinity in Philippsburg führte mich dann zum Webshop. One of the best features in the CED XL-Professional Range Bag is its fantastic shoulder strap. 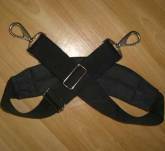 The strap is contoured and has high-grip rubber on the inside for a more comfortable secure carrying position. Its stainless steel, clip on/off rings, allow it to be easily attached to any kind of bag you need to carry. Use it with your current range bag, school bag or laptop briefcase. It adds comfort and convenience to anything heavy you need to carry on your shoulder.